Paragon Bioservices is opening a manufacturing facility near Baltimore-Washington International Thurgood Marshall Airport that the company says will create 150 job. The biologics contract development and manufacturing organization said the new facility will help the firm employ 500 people in Maryland by the end of the year. The 200,000-square-foot facility has 500L and 2000L bioreactors that are used to produce materials used in gene therapy and next generation vaccines. Paragon has been a fast-growing business in Maryland. When it announced the manufacturing facility project last year, it employed about 225 people at the University of Maryland Biopark in Baltimore. It currently employs about 350 people at its facility in the Biopark. The new facility is expected to add another 150 jobs. Gov. 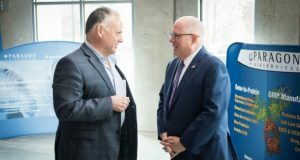 Larry Hogan, who toured the facility Thursday, said it is a sign of Maryland’s position as a biotech hub.